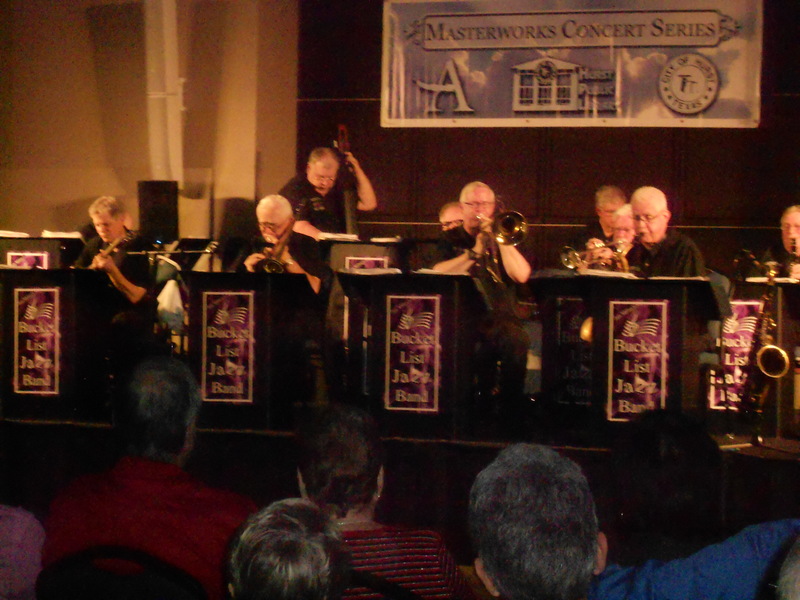 I took my husband to a performance of the Bucket List Jazz Band, a group of ten men who play old time jazz melodies with flair and originality. Several members played original improvised trumpet solos during many of their numbers. One player kept switching from a baritone saxophone to an alto one and back. When they played and sang “When the Saints Go Marching In,” the audience clapped. Originally an American gospel hymn, it was made famous after Louis Armstrong recorded it on May 13, 1938. They also performed “Ain’t She Sweet.” My toes were tapping to their rendition of South Ramparts Street Parade, taking me back to hearing the Michigan State University marching band play at football games. The leader said forming a jazz band was on his bucket list, so he rounded up musicians and named the band, the Bucket List Jazz Band. This entry was posted in Delicious dishes and tagged Bucket List, Jazz Band, Jazz Music. Bookmark the permalink.